Saraswati Puja in Bengal is observed on the Magh Shukla Paksha (Magha Bahula) Panchami – fifth day during the waxing phase of moon in traditional calendar followed in Bengal. Saraswati Puja 2019 date in Bengal is on February 10. This puja is of great significance in Nepal, Bengal, Orissa, Jharkhand, Tripura and Assam. Freshly made murtis of Goddess Saraswati are prepared on the day. The color Yellow is given importance on the day. 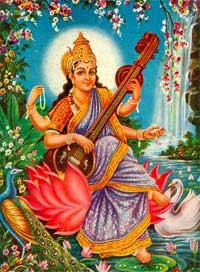 The day is observed as Saraswati Jayanti and Basant Panchami in North India. Toddlers are initiated into the world of letters on the day. Young children would sit in the lap of the priest or elders; hold a piece of chalk in his fingers and with the Goddess as witness writes at least one alphabet in local language under the guidance of the elder or priest. School children, college goers, artists, musicians, teachers and all those people directly or indirectly associated with letters and music actively participate in the Saraswati Puja. Some people place their books, articles, instruments of music and arts before the goddess and seek their blessings and are not used in the day. The basic requirements for the Saraswati puja include the mandatory flower known as the palash. Earlier these used to be the implements for writing on paper by the school children. Other mandatory items are the ‘kul’ or plums which are distributed as Prasad. Similarly, the flowers of the mangoes are a must. The children observe fast and break the fast by chewing these flowers.